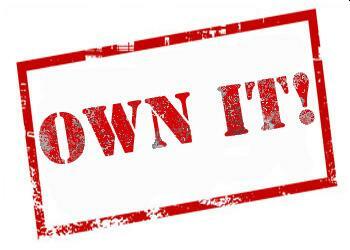 One of the major issues causing problems in America today is that people really struggle to take OWNERSHIP. We are living in a generation where many people displace the blame and do not take personal responsibility. Am I right? Yes, I know there are plenty of legitimate reasons people have for how things turn out in certain areas, and I’m not trying to minimize that. But many times, it’s just not helpful to focus on those things. So I’m suggesting we shift our perspective and take ownership so we can actually accomplish something rather than spending our time blaming, avoiding responsibility, complaining, and making excuses. We have to draw the line somewhere. We have to CHOOSE to take OWNERSHIP. Honestly, it’s pretty empowering to know that you are RIDICULOUSLY in charge for many of the outcomes in your life. If we take an inventory of our lives, what are the things we would like to change? If you “begin with the end in mind” and think about how you’d like a certain area of your life to look, you can start making the changes to move in the direction of that desired outcome. In my experience, it has been so much easier to grow in an area when I take ownership first. Here are a few of the areas we can take inventory. Instead of blaming our boss, employees, or company, focus on what WE can do to work hard as if working for the Lord to gain influence, improve production, and grow our business. Instead of focusing on the church, the preacher, “hypocrites,” trials in our life, focus on what WE are doing to draw near to the Lord through studying the Word, obedience, prayer, serving, and bringing others to Christ. Instead of focusing on our genetics, focus on healthy lifestyle choices WE make daily (more sleep, less stress, healthy eating, exercise, clean water, etc. )to improve our overall health & “turn off” genes. Instead of losing our patience with our kids, focus on how WE can have self-control and respond in love and patience. Instead of making excuses for why we can’t keep a clean house, make healthy meals, stay on budget, work out, forgive someone, have a quiet time, give up unhealthy habits, stop watching trash tv or listening to junky music, get out of debt…take ownership and make the choice to practice discipline. It’s not about perfection, but it is about progress and striving to be the best version of myself. I don’t want to raise entitled children. I want to raise kids who become great adults, so that means I have to teach them to take ownership. And the only way I can do that with integrity is to model it myself.